Count Emicho of Leiningen had gathered his forces to serve the cause of God in the People’s Crusade (First Crusade), though it seems his personal goal was to rid Germany of its Jewish population. On May 18, 1096, he led his men in a wholesale slaughter of 800 Jews in the city of Worms, just one of many such massacres (pogroms) of Jews in actions called the “Rhineland Massacres” led by Count Emicho and other Crusader leaders such as Peter the Hermit. Count Emicho with his army of 10,000 men, women and children was a significant perpetrator of the massacres as his “army” marched toward the South and East to Turkey on their way to the Holy Land. Emicho not only saw fit to murder Jews as part of his “holy” mission, but he also intended to usurp the Byzantine Emperor in Constantinople and declare himself the Last World Emperor. Emicho had claimed that holy visions guided his actions. Among his army were a faction of people that worshipped a goose they believed had been imbued with the Holy Spirit! Consisting of a main fighting force of knights supported by common folk and their families (peasants), later excuses that the massacres were perpetrated by ignorant peasants beyond the control of Emicho did not ring true, as the knights and noblemen had obviously directed the murders. Violence against the Jews followed refusal by the victims to convert to Christianity, even though such forced conversion at the time was not permitted under Church Law. The Army of Priest Volkmar and Count Emicio Attacks Mersburg. 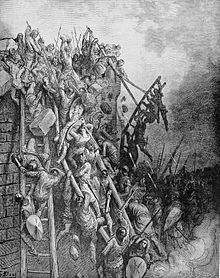 In the battle against Merseburg, the Crusaders are panic-stricken when several ladders collapse under their weight. Emicho and his horde also massacred Jews in the city of Mainz, even though the Jews had sought and were granted asylum by the local Archbishop. 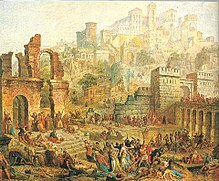 The Crusaders were locked out of Mainz, but sympathetic city folk opened the gates, and the Crusaders broke into the palace of the Archbishop where the Jews were being sheltered. Emicho and his mob never made it to the Holy Land, getting only as far as Hungary when they ran out of money and supplies. Not surprisingly, given their history, they pillaged and looted in Hungary with many of their number being killed by Hungarians. Emicho went back home in humiliation for failing to take part in the reconquest of the Holy Lands. Remnants of his army that were not killed or returned home joined other Crusader armies and continued their journey. The Crusades provide a mixed bag of devotion and atrocities, often on both sides of the fight. Christians often fought other Christians, Jews were scapegoated, and the Muslim “foe” was often recruited as allies for some of the Christian armies against other Muslims or other Christians. So convoluted were the relationships between the various factions, that an attempt to keep track of which leader was aligned with which other leader is a daunting task, as those relationships often changed. The First Crusade resulted in Christian conquest of Jerusalem, and over the next few centuries other Crusades and battles would follow over this contested land sacred to Muslims, Christians and Jews. Unfortunately, even today there is conflict over possession of Jerusalem and the Holy Land, with many Christians in support of Israel maintaining possession of the Holy Land as a way of keeping the Muslims out. What do you think of the Crusades and the situation in the Holy Land? Why do you think Emicho and other “Christians” were so eager to murder Jews? Give us your thoughts on these subjects. Ashbridge and Perkins. The Crusades: The Authoritative History of the War for the Holy Land. HarperAudio, 2016. Madden, Thomas. The Crusades Controversy: Setting the Record Straight. Beacon Publishing, 2017.